This page introduces key concepts that will help you to get up and running in NVivo. Find out more about the types of files you can import and refer to Bring in your files and get organized for ideas about how you can prepare and manage your files. You code your files to gather material about a topic and store it in a container called a node. 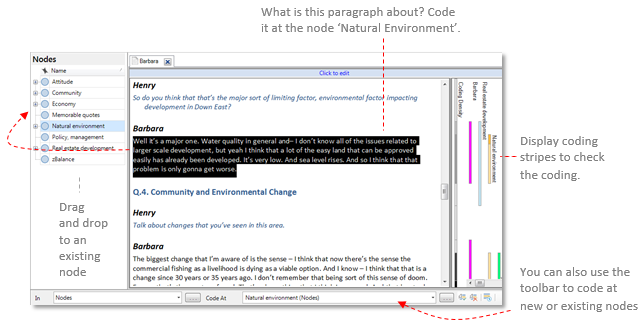 As you explore your files, you can select content and code it at a node. For example, while working through your interviews you find that a number of participants talk about the natural environment—code each occurrence at the node Natural Environment. Refer to Coding for information on ways to code (along with links to detailed instructions). For coding strategies and ideas, refer to Code files and manage nodes. 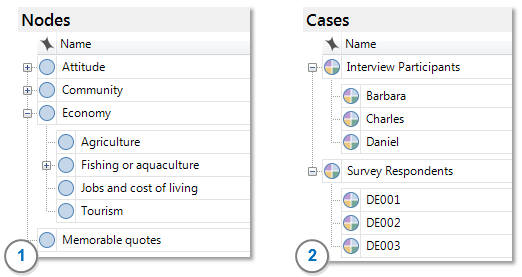 You can create different types of nodes in your NVivo project to represent the themes and cases in your data. 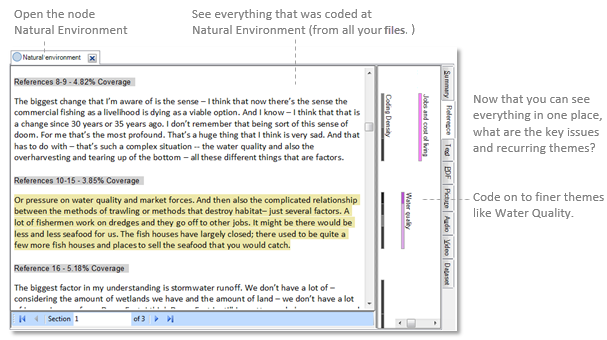 1 Theme nodes represent the topics found in your files. These nodes might be descriptive (this text is about that topic) or more analytical (this issue matters because...). 2 Case nodes represent your 'units of observation'—which might include people, places, sites or organizations. You can use case classifications to record information about your cases. The demographic attributes of your participants (for example, you may want to compare attitudes based on gender or age). The attributes of places, organizations or other entities (for example, you could compare how issues are handled in large and small schools). Refer to Create case classifications for detailed instructions. 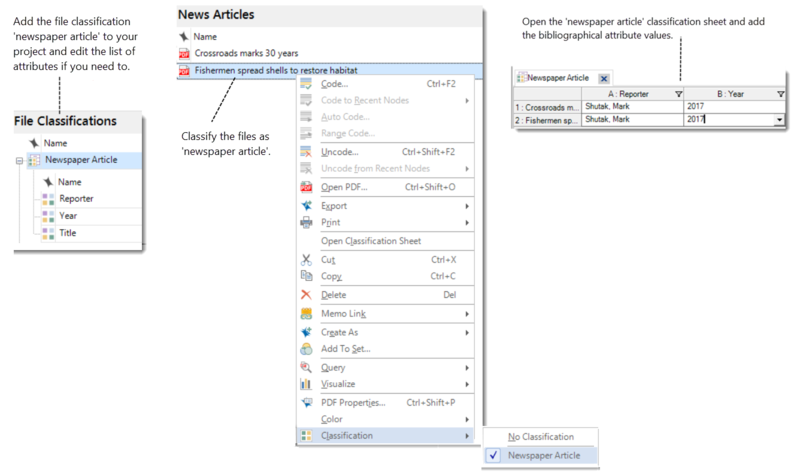 You can use file classifications to manage the bibliographical attributes of your files. 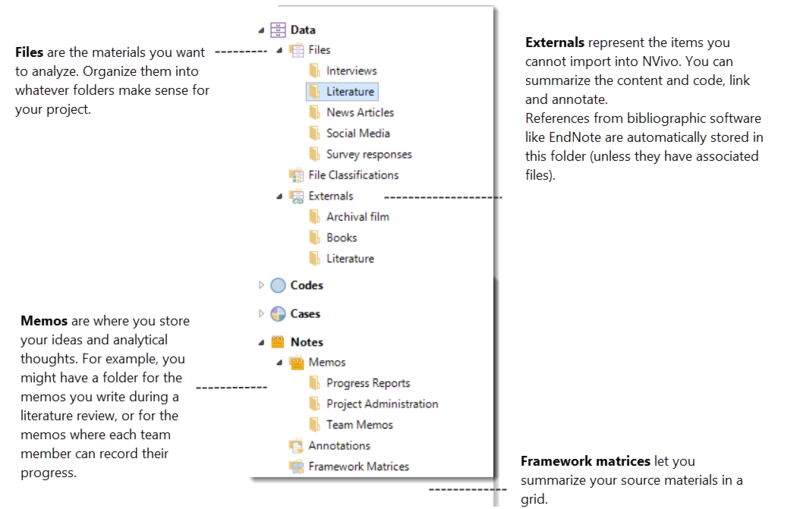 You can import this data from reference management tools like EndNote or Zotero—or you can create it in NVivo and export it when you are ready to write-up your project.